A spectacular golden wreath dating back to the 4th Century BC is due to go on display at the National Archaeology Museum in Greece. 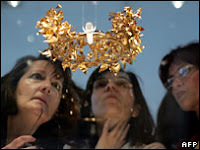 The Macedonian wreath was returned to Athens at the weekend by the Getty Museum in Los Angeles. Greece fought for 10 years to prove that it had been illegally spirited out of the country. The restitution of the wreath is part of a campaign aimed at restoring the Elgin (Parthenon) Marbles to Greece. Now restored to its rightful home, the wreath is one of the most exquisite treasures in Greece. It is a floral crown, a confection of realistic leaves and flowers made of gold foil attached to a slender headband 28cm (11in) in diameter. It was probably made after the death of Alexander the Great and worn on ceremonial occasions. Experts believe it was buried with the remains of its owner in northern Greece. The Getty's director, Michael Brand, told the BBC in a statement that everyone was saddened to see the wreath leaving, but that returning it to Greece was the correct action to take. Greece hopes that other museums will now follow the Getty's example. In particular, it wants the British Museum in London to hand back the frieze known as the Elgin, or Parthenon, Marbles. Greece claims they were stolen by Lord Elgin in 1801, but the British Museum insists that Lord Elgin legally obtained the Marbles from Greece's then rulers, the Turkish Ottoman Empire. Moral pressure on Britain is due to increase later this year when Greece opens the new Acropolis Museum, complete with an empty space designed to show off the marbles in Aegean light, instead of what critics call "a gloomy cellar in London's Bloomsbury district".